​﻿Family, Career and Community Leaders of America is a national Career and Technical Student Organization that provides personal growth, leadership development, and career preparation opportunities for students in Family and Consumer Sciences education. FCCLA is the Ultimate Leadership Experience! 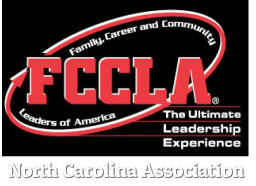 Thank you to all of the advisers, FCCLA members, parents, and guests who joined us at the State Leadership Conference! NC FCCLA what is "your story"? Need Help on Affiliation and How to pay Dues? Click Here! Mandatory Online Star event summary Form for SLC & NLC!